Oak Ridgers have coyotes on their minds again. The last time this animal was a hot topic was 2006-2007. The city Environmental Quality Advisory Board (EQAB — I was chairman then and I’m a board member again now) had long discussions of coyote sightings, disappearances of pet cats, etc. We learned that the Tennessee Wildlife Resources Agency (TWRA), not city animal control, has jurisdiction over wild critters like coyotes. EQAB members studied up on the biology of coyotes and their management. We concluded that these animals are here to stay, and that the best way for the City to deal with them would be to help residents get good advice on coexisting with these animals. It doesn’t look like very much has changed since 2007. The only new wrinkle is the information, based on scientific research in the northeastern U.S., that the coyotes in the eastern states may be “coywolves” — the result of crossbreeding between coyotes and eastern coyotes. (Read all about it at easterncoyoteresearch.com.) Also, now we have an Oak Ridge coyote tracking page on Facebook. When did coyotes show up in Oak Ridge? From ORNL: Historically known as an animal of the wild-west, the adaptable coyote has expanded its range into eastern North America while other carnivore populations (e.g. , wolves) have declined. Coyotes are now found in every corner of the United States, and they shift their behaviors to fit new habitats. The first coyote probably crossed the Mississippi River into Tennessee around 1965. On the Oak Ridge Reservation (ORR) the first reported sighting of a coyote was in 1978, and the first coyote road kill happened in 1984. That same year, a pair of coyotes were observed raising a litter of pups on the east end of the reservation. In 1987 a pair of coyotes were trapped on the ORR and equipped with radio collars. They were radio-tracked for nine weeks during which time they ranged over an almost 4-square mile area. 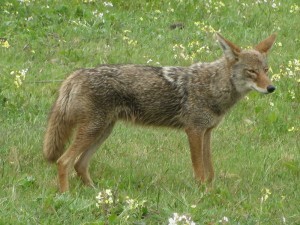 In 1990 ORNL researchers estimated that approximately 12 to 16 coyotes existed on the reservation. … Using known population densities from studies in other areas of the country, it is estimated that the reservation could potentially support as many as 50 or more coyotes. Why are coyotes here now, when we didn’t have them before? From the EQAB article: People unwittingly helped coyotes flourish when they exterminated most of the wolves in the United States. Coyotes became top dog, filling the wolf’s ecological niche. Deforestation and agriculture opened up previously dense tracts of forest, and human settlements, with their garbage, vegetable gardens, compost piles and domestic pets, provided food. Describe the coyote’s “lifestyle” and what they eat. A typical group of coyotes consists of a breeding pair and their offspring. The family group is largest in the summer when the pups, parents, and non-breeding adults are together at their den. Coyotes den in a variety of places, including brush-covered slopes, steep banks, rock ledges, caves, thickets, and hollow logs. Dens of other animals (such as groundhogs or foxes) are frequently used. In urban areas dens may include storm drains; culverts; holes in vacant lots, parks, and golf courses; and under storage sheds or porches. Coyotes breed during January through March and typically produce five to six pups 60 to 63 days later. The entire family unit, including the mother, father, and other non-breeding family members, helps raise the young by providing food. Young coyotes begin dispersing in October and may travel up to 100 miles from their birthplace. They communicate through a series of yips, barks, and howls. A common call of the coyote is two short barks followed by a long wavering yodel known as the howl. Adult males have large territories (15-25 square miles) in which they roam; adult females occupy areas of six to ten square miles. The availability of food affects territory size. Contrary to popular belief, coyotes do not hunt in packs. They are relatively solitary hunters, but they may hunt in groups when food is plentiful. They may also form packs to defend territories. The coyote will eat almost anything, including rodents, rabbits, muskrats, groundhogs, squirrels, skunks, raccoons, songbirds, insects, watermelons, apples, and persimmons. They prefer fresh kills but will eat carrion. Recent studies have also shown that coyotes eat Canada goose eggs, goslings, and occasionally adults. Coyotes may take as many as 70 to 80 percent of the fawns of urban deer. Unfortunately, in urban areas their diet may also include garbage, pet food, cats, and small dogs. When we see coyotes in neighborhood streets and yards, in the daytime, does that mean they are desperate for food, and dangerous? In urban areas where coyotes aren’t hunted or trapped, they may lose their fear of humans. If they associate people with an easy and dependable source for food, they can become very bold. They will come up to the door of a house if food is regularly present. Coyote attacks are, however, extremely rare in contrast to the 4.7 million dog bites recorded in the United States each year. A person is millions of times more likely to get attacked by the family dog than by a coyote. Wouldn’t it be a good idea to get rid of Oak Ridge’s coyotes by capturing them and killing them? Eliminating individual coyotes doesn’t control their population. Remember that they produce litters of 5 or 6 pups. They also produce more young when their populations are low. This makes it very difficult to reduce coyote numbers. Scientists have determined that it would require removing nearly 70 percent of the population every year to maintain a sustained population reduction. If we can’t rid of them, what we do to reduce the problems coyotes cause for our families and our pets? * Do not feed coyotes! * Eliminate sources of water. Water attracts rodents, birds, and snakes that coyotes feed on. * Position bird feeders so that coyotes can’t get the feed. Coyotes are attracted by bread, table scraps, and even seed. They may also be attracted by birds and rodents that come to the feeders. * Do not discard edible garbage where coyotes can get to it. * Secure garbage containers and eliminate garbage odors. * Place trash cans out on pickup day. Putting them out the night before allows coyotes to scavenge under cover of darkness. * Do not leave barbeque grills outside and uncovered. Food smells from the grill will attract coyotes. * Feed pets indoors whenever possible. Pick up any leftovers if feeding outdoors. Store pet and livestock feed where it is inaccessible to wildlife. * Trim and clear, near ground level, any shrubbery that provides hiding cover for coyotes or prey. * Fencing your yard could deter coyotes. The fence should be at least 6 feet high with the bottom extending at least 6 inches below ground level for best results. * Don’t leave small children unattended outside if coyotes have been frequenting the area. * Don’t allow pets to run free. Keep them safely confined and provide secure nighttime housing for them. Walk your dog on a leash and accompany your pet outside, especially at night. Provide secure shelters for poultry, rabbits, and other vulnerable animals. * Discourage coyotes from frequenting your area. If you start seeing coyotes around your home or property, chase them away by shouting, making loud noises or throwing rocks. Two bits of good news in a row: (1) The Oak Ridge Revitalization Effort now owns the Alexander Inn and (2) an additional trail segment has opened on the Black Oak Ridge Conservation Easement in westernmost Oak Ridge. Hurray for the people whose volunteer efforts are making good things happen! It’s official. The Oak Ridge Revitalization Effort now owns the Alexander Inn/Guest House. Plans are underway to begin cleaning up the grounds as quickly as possible. The Rogers Group is generously providing 250 tons of gravel to fill the stagnant swimming pool immediately and Robert McNabb is providing the trucks and labor. We encourage all those interested in this property to join us in City Court on Monday, December 21 at 8:00 AM to show your support during the hearing scheduled to address current code violations. For your holiday enjoyment, an additional 0.8 miles of trail have been opened in the NE corner of the Black Oak Ridge Conservation Easement. See updated trail map and Google maps at this page on Tom’s website. The new trail includes the boundary gravel road section (0.3 miles) that descends toward Blair Road, connected back to the entrance gravel by 0.5 miles of single-track (Twisted Beech Trail). Trail work and design were guided by TWRA’s Jim Evans and Larry Creech with help from numerous volunteers. Black Oak Ridge Conservation Easement includes 3,073 acres on Black Oak Ridge and McKinney Ridge in the western part of Oak Ridge. The Tennessee Department of Environment and Conservation, the Tennessee Wildlife Resources Agency and DOE manage the site. It contains interesting community types and species such as hemlock-rhododendron forest, beech maple forest, cedar barrens, fringe tree, spider lily, spreading false-foxglove, white-topped sedge, Vaseys trillium, Tennessee dace and southeastern shrew. Some of these species are unusual for the Ridge and Valley region. The area currently has more than eleven miles of trails, mostly on gravel roads, which are considered moderately difficult. The trails are open daily from daylight to dusk, and are limited to hikers and bicyclists. No motorized vehicles or animals are permitted, with the exception of motorized wheelchairs and service animals. I’ve heard from an Oak Ridger who is concerned that his neighbors have been feeding raccoons. As far as I know, there’s no local ordinance or state law against feeding wild animals in Oak Ridge, but I wonder if that’s a direction that the city might need to take in the future. Cities in bear country (such as Gatlinburg) ban feeding of bears, and some cities around the country (particularly in California and the Rocky Mountains) already restrict feeding of other wild animals, such as deer, coyotes, raccoons, foxes and opossums (but they do not ban birdfeeders for wild birds). This is a restriction that people would dislike, but unfortunately there are plenty of excellent reasons not to feed wild animals. 1. Some of the food that is put out probably gets eaten other animals that we don’t want in our yards and neighborhoods. People who intend to feed raccoons are probably also encouraging coyotes, skunks, or rats. 2. As a general rule, human food is not good for wild animals. 5. Wild animal populations (for example of raccoons and skunks) may grow unnaturally large because the animals are being fed. This not only increases the likelihood of damage from the animals, but increases the potential for transmission of rabies, distemper and other diseases that spread faster in denser populations. Cougars, and coyotes, and bears, oh my! It’s romantic to think that native cougars have somehow managed to survive in Oak Ridge’s extensive green spaces, but wildlife experts say that any cougars sighted around here are almost sure to have been individual “pets” that escaped (kind of like the peacock that roamed my neighborhood and other parts of the city several years back). It’s very unlikely that there’s a wild population of cougars here. Coyotes, on the other hand, have “gone native,” here and everywhere — like it or not, they’ve become part of our world. Fortunately, all of these animals generally steer clear of humans, but (as Suffern’s letter says) they are dangerous and we all should be aware of their presence. I read the letter. I wasn’t convinced, and I can’t judge the reports reliable on the information given. And yes, we have had black bear reports (probably more likely) . . .
As it happens, just this week a black bear was spotted in town, not to mention being photographed… In spite of the extent of Oak Ridge’s greenbelts and the fact that black bears are reported to live in relatively developed places (such as suburban New Jersey), I imagine that this bear was feeling confused — and anxious to get out of town and away from people.